ART Kameyama is a yearly competition for a week-long art event held along the main street in a small town Mie prefecture of Japan. Rather than a design a temporary work, studio_01 led a workshop with students from Tokyo and Mie to design a piece of furniture that would remain in Kameyama even after the event. 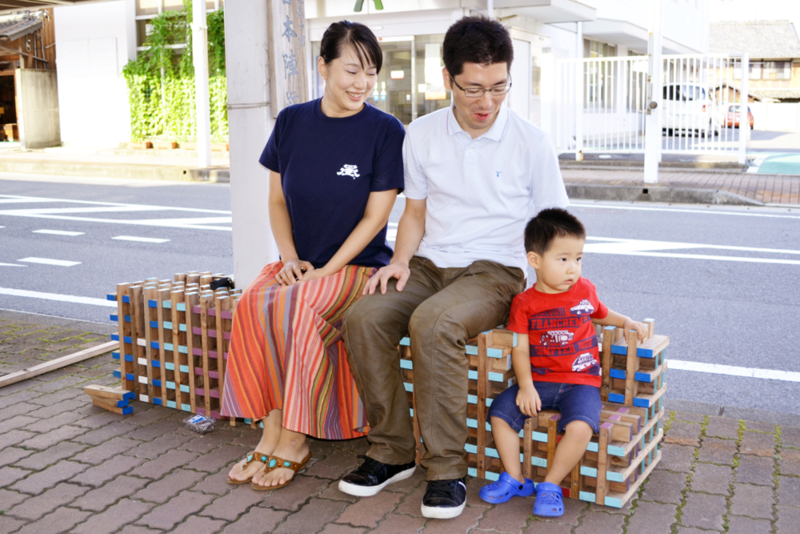 kumiki, literally meaning 'a latticework of wood', is a bench made from a 3D grid of waste cedar. By cutting away select portions of the grid, a variety of additional features are revealed such as a bike support, umbrella stand, and a child's seat. These slices into the original grid are organized in such a way that require the use of 11 different lengths of cedar, each marked by a different color which both aids with construction like a visual numbering system as well as adds to the overall design. Through the use of the various colors, the juxtaposition of the different voids are projected onto the bench's surface, tying interior functions to exterior expression. This seen yet unverbalized colorful expression of functions allows the user to be surprised by new usages each time they pass by kumiki.